Papertrey Ink will be offering customers a freebie this December, a little mini set that Heather designed called Pretty Petals. Be sure to visit Nichole's blog today for more info. The sweet flower has separate leaves and center images to allow for maximum color combinations! My color combo may be a simple one, but it really makes quite a statement. I chose to work with smokey shadow, soft stone and limeade ice. The petals were stamped using the generation stamping technique, stamped three times without reinking. Which created a cascading effect. 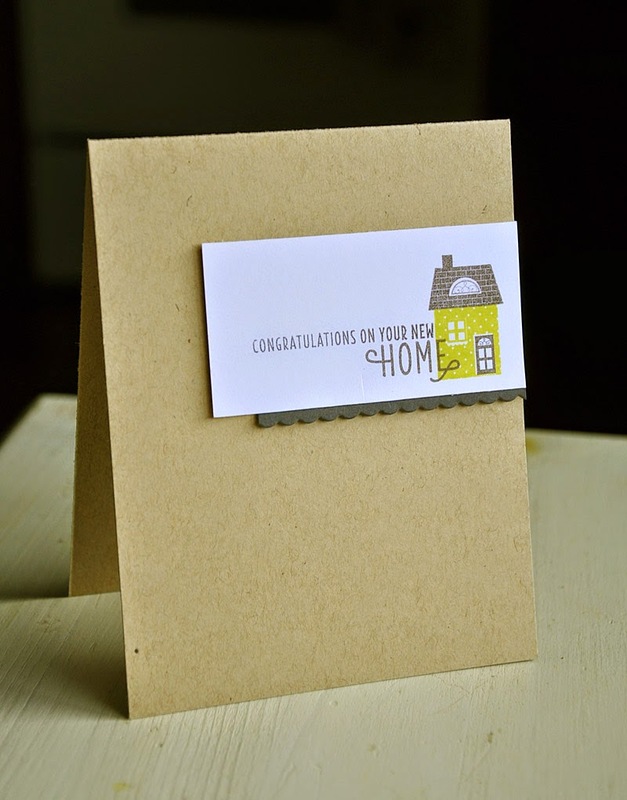 To make an impression with the sentiment I knew I wanted it to be the only pop of color, and so I stamped it in smokey shadow ink onto a strip of limeade ice cardstock. 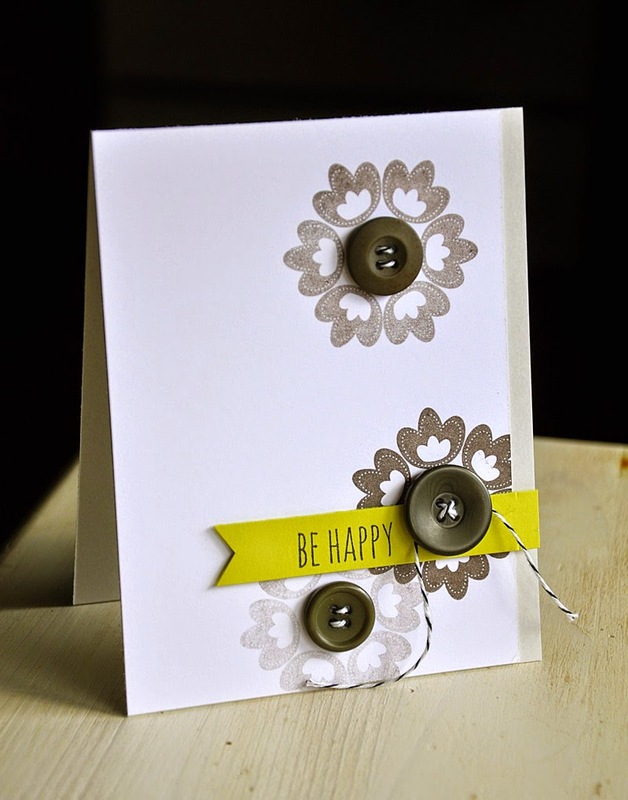 Then finished the card off with a few matching buttons and baker's twine. 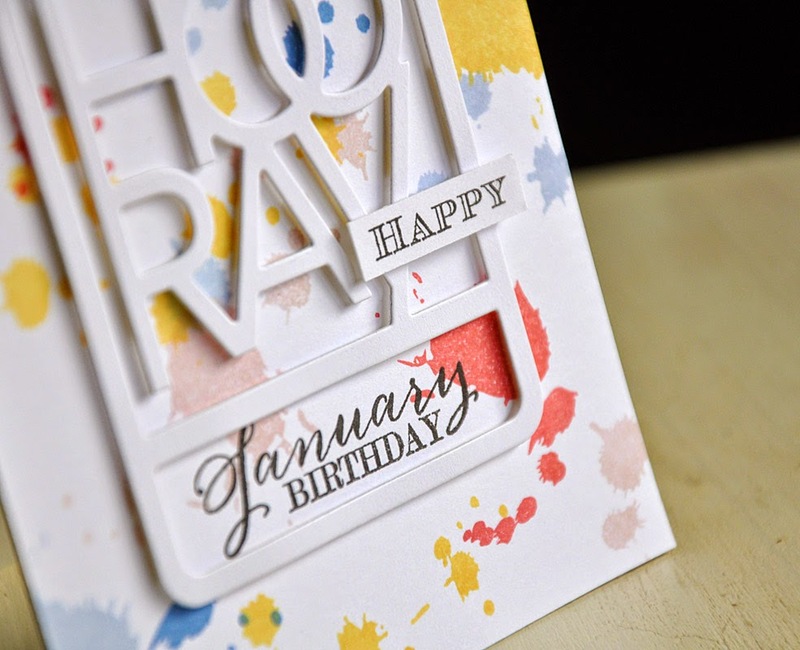 The Papertrey Ink December countdown is about to come to an end and I'm here to share my final projects with you today. But, before I do, let me remind you that everything you've seen peeks of will be available for purchase through Papertrey Ink beginning 10 pm EST tonight. 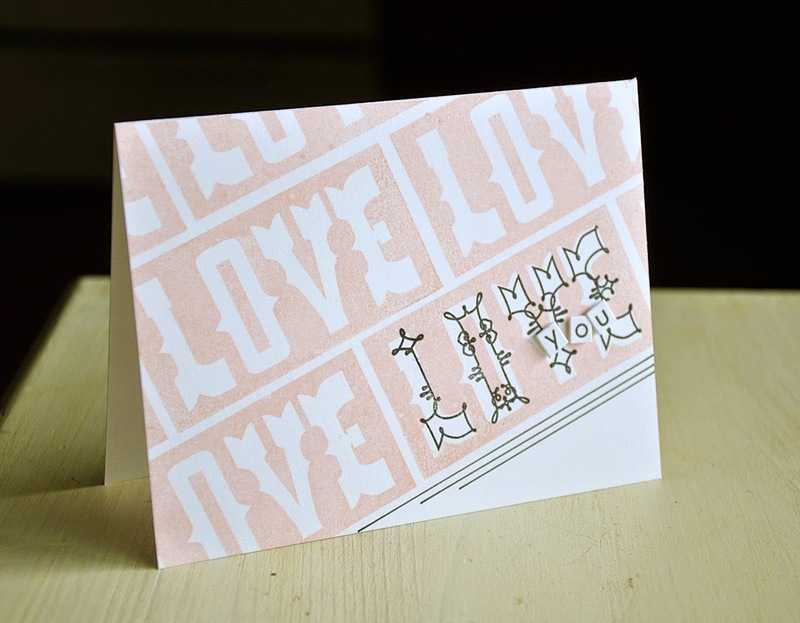 Love Notes by Erin Lincoln and Type Strips II by Nichole Heady. Phrase Play #11 by Nichole Heady. Paired with the previously released Birthday Style. 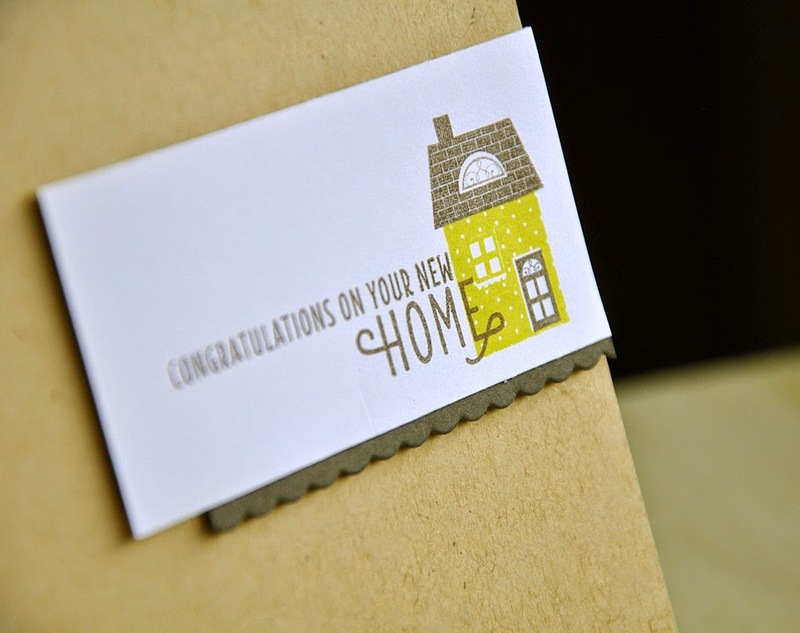 Tinsel & Tags House Additions by Betsy Veldman. 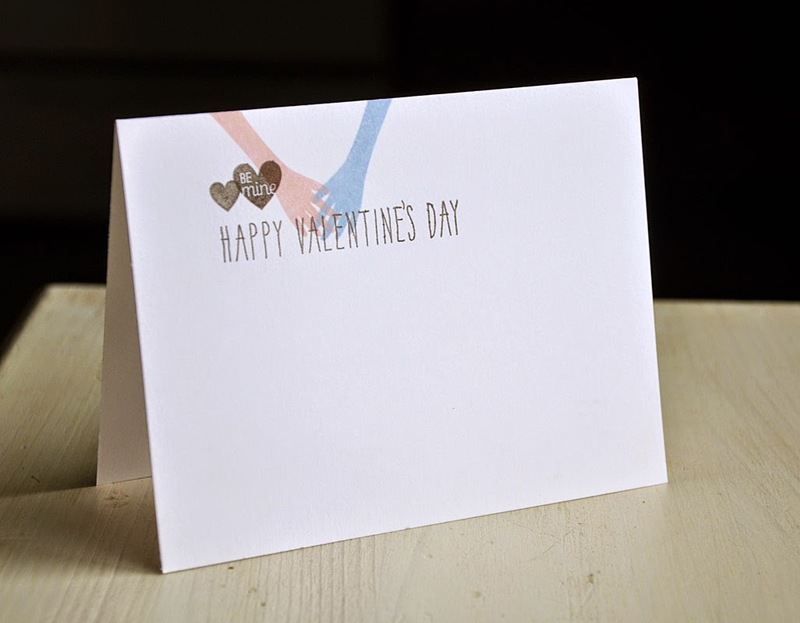 Give Me a Hand by Lexi Daly and Keep It Simple: Valentine by Nichole Heady. 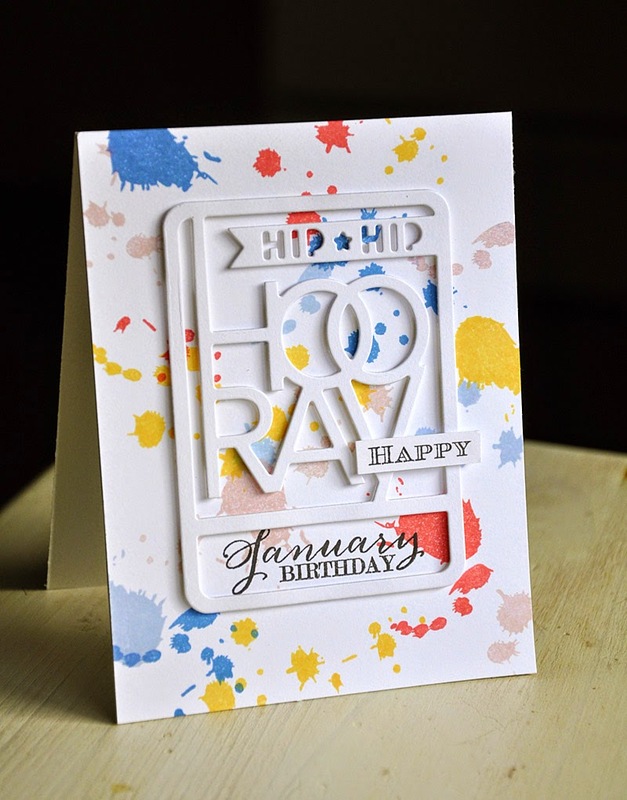 Drips & Dribbles by Lizzie Jones and Birthday Classics: January by Dawn McVey. Block Party by Lizzie Jones. Hello There by Melissa Bickford. Welcome to the final day of the Papertrey Ink December countdown. 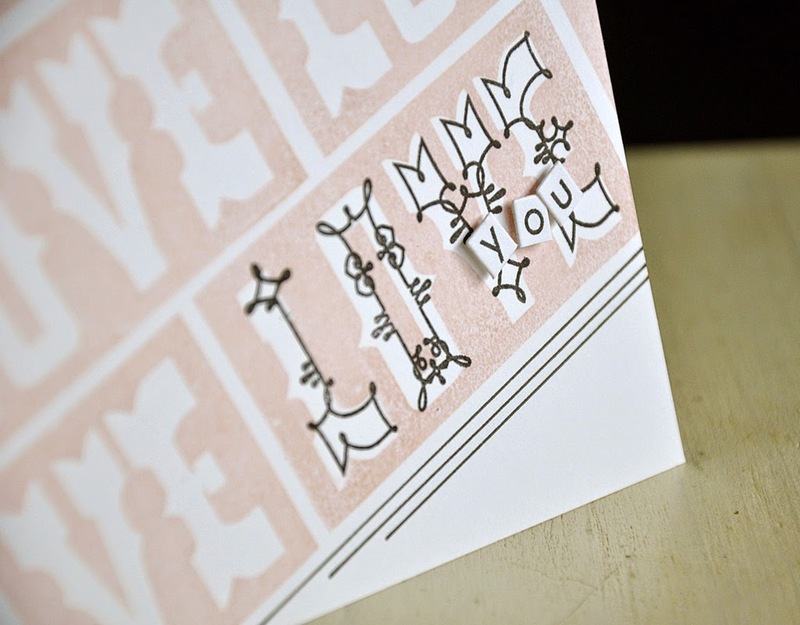 Today's post is all about the amazing Love You to Pieces Collection, created by Betsy. This feature is absolutely one your going to fall for. I have, and so has my son! 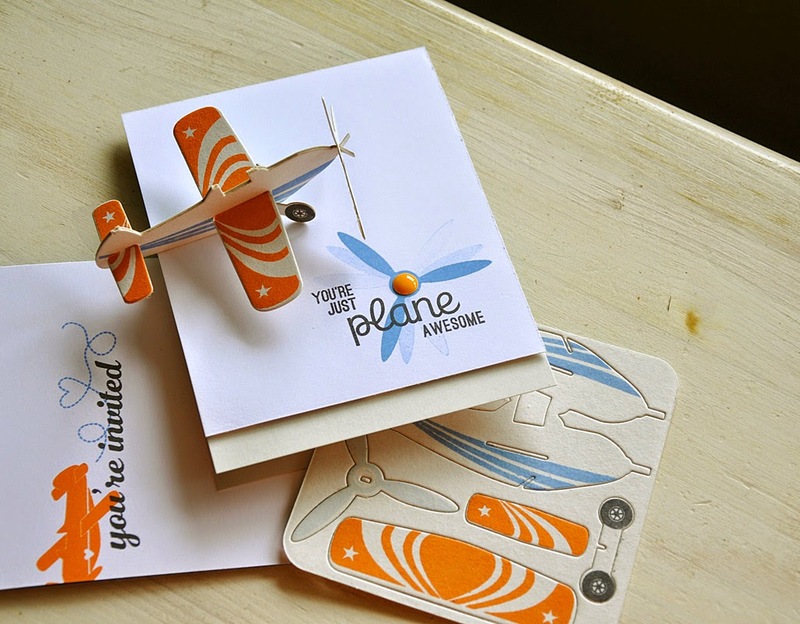 He insists that we create these coaster card valentines for his friends and family. I'm happy to oblige. But first, I have an upcoming birthday to attend to. My youngest will be turning one very soon and we plan to have a party for him after the busyness of the Christmas season is over. Can you guess what the theme will be? Yep. You guessed it... Airplanes! How perfectly timed is the release of this set?! Here's what I have in mind. 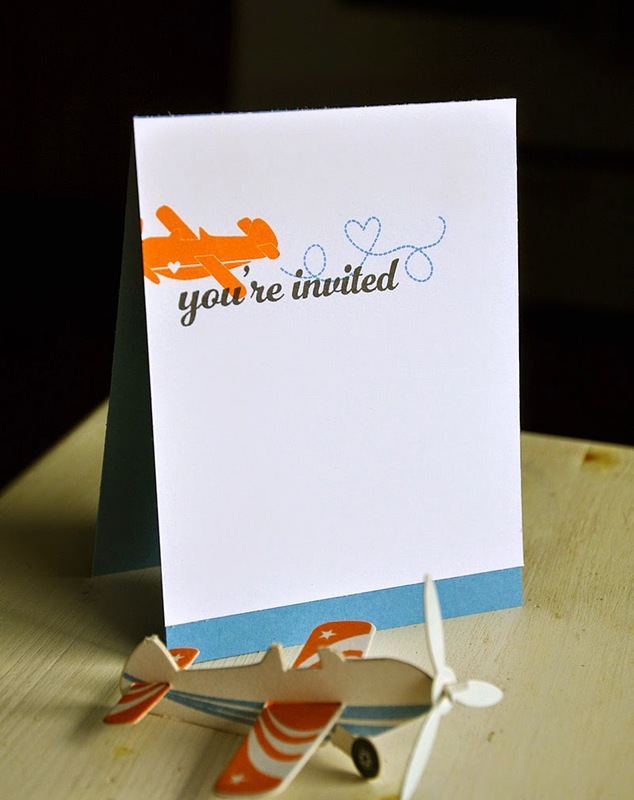 The invite, thank you card and favor. 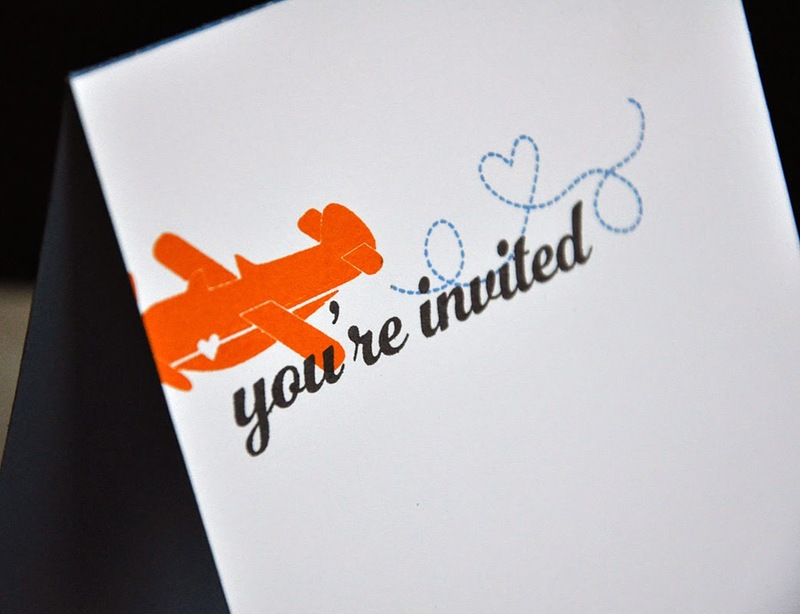 A quick and simple invite that can easily be mass produced. I kind of like it a lot. To save even more time I attached both the airplane and the heart trail onto the same acrylic block and then carefully inked up each before stamping. 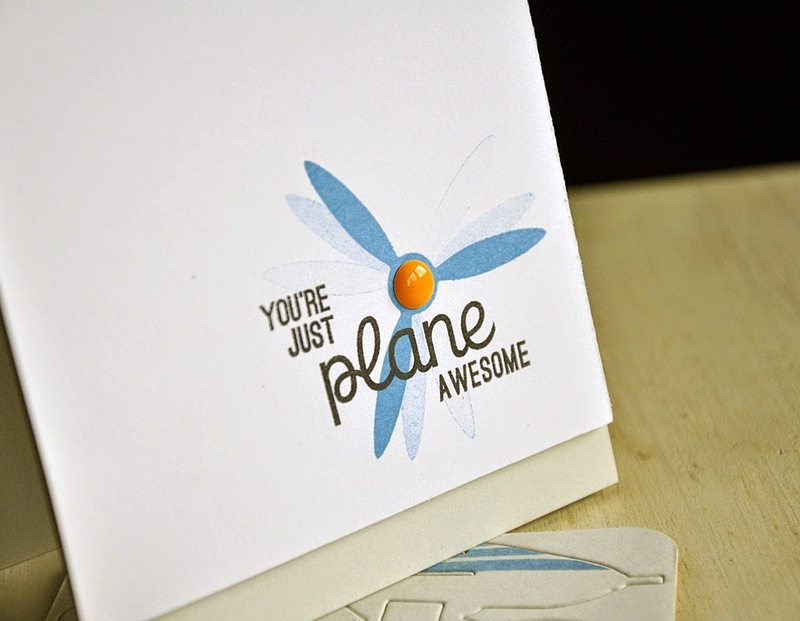 Here's a little card to say thanks for coming. Here's a note... 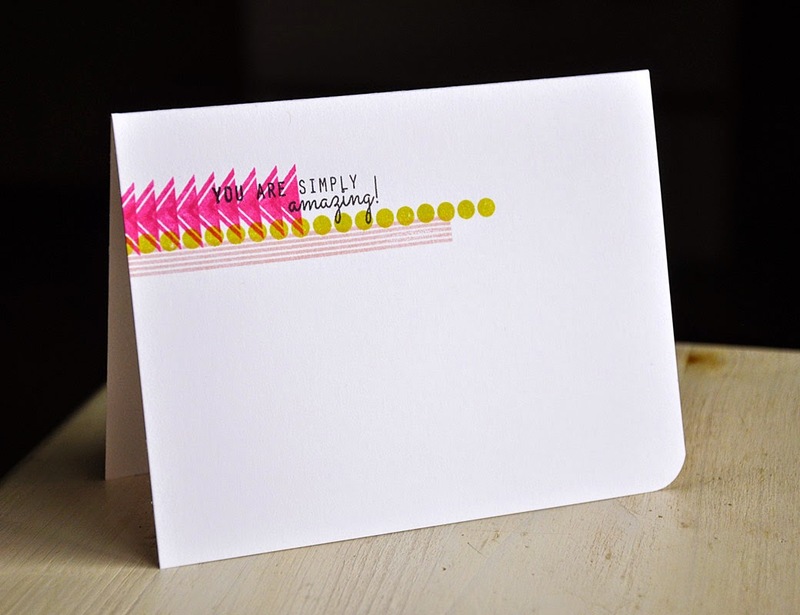 This design and sentiment also works perfectly for birthday cards too. 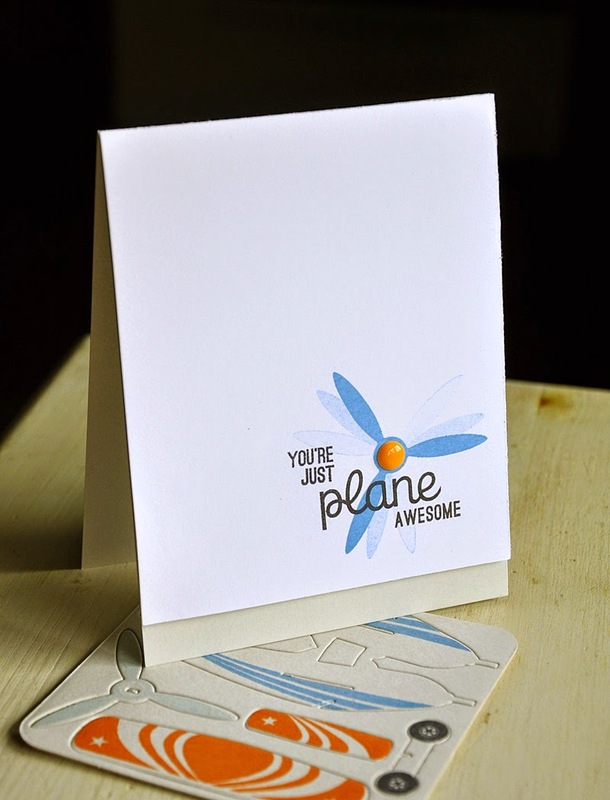 I plan to include the airplane coaster card inside the thank you card as a sort of favor. It fits nicely inside. I played around with the prop for this simple layout. A little generation stamping to play a trick on ones eye, and make the prop appear to spin. Kinda fun! Here's how... Ink your stamp. Stamp once, rotate, stamp twice, rotate, and stamp a third time. All without reinking. Well, that's all I've got for you today. Just remember... everything you've seen peek of today will be available for purchase through Papertrey Ink, beginning December 15th. 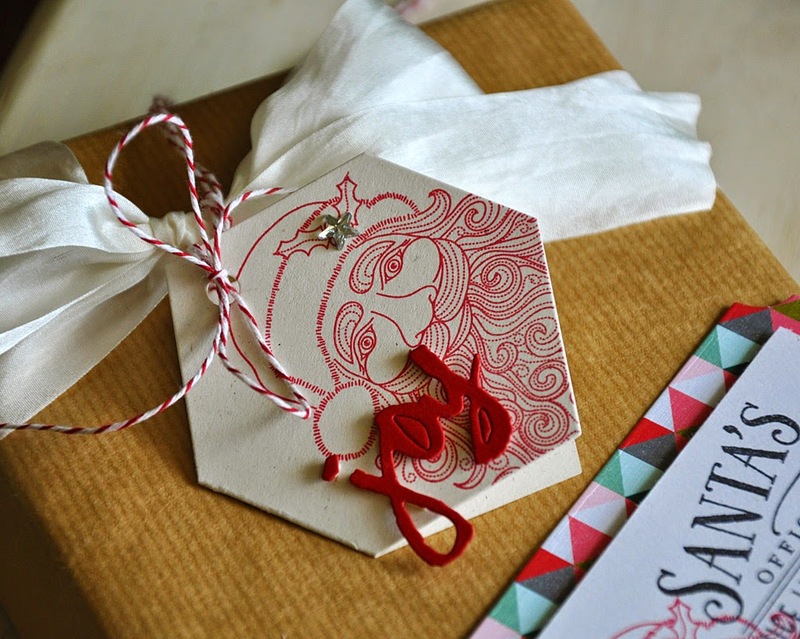 Hello and welcome to the fourth day of the Papertrey Ink December countdown! 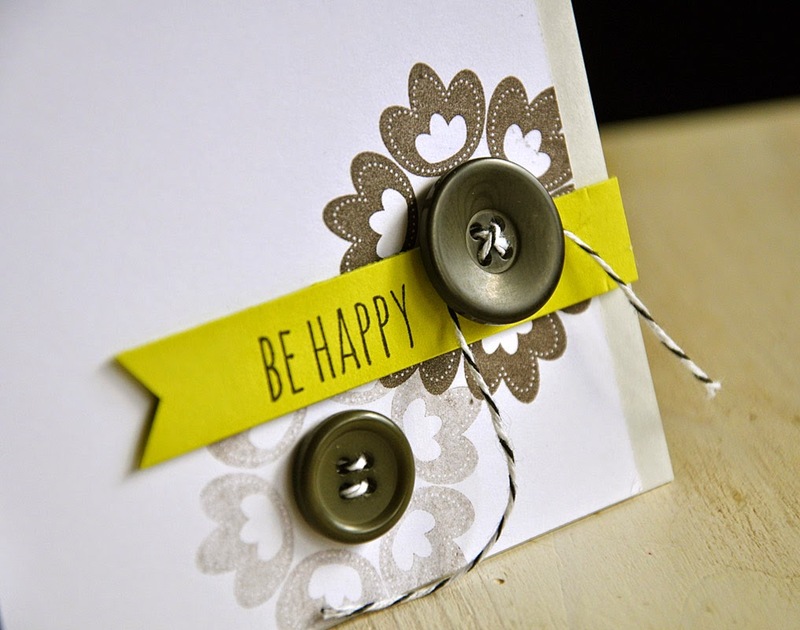 Today's group post is all about the new set Big Hugs and coordinating dies. 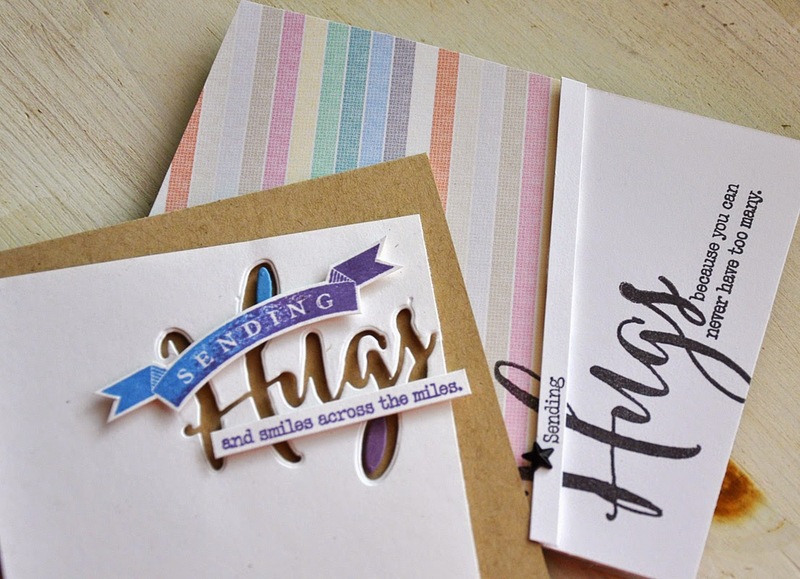 When a hug in person is just not possible, send someone special a heartfelt hug via the mail. 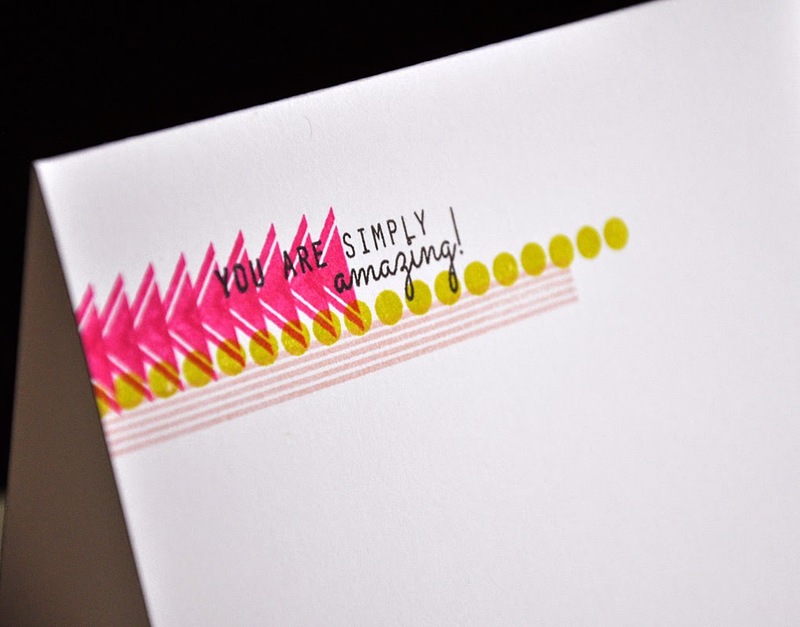 A card lovingly created using these touching sentiments is sure to cheer up anyone in need of an embrace. Here's a cute card combo that show you just how versatile these new items are. 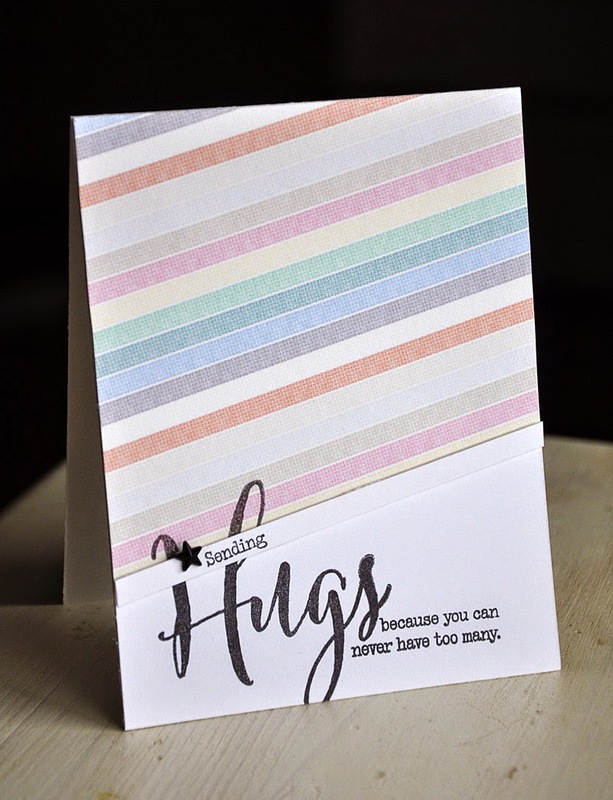 One card utilizes one of the Big Hugs dies and a second card uses one of the "Hugs" stamps. First up, the stamped version. I topped the card base with stripy paper (I've had this piece laying around for too long) and adhered it at an angle. 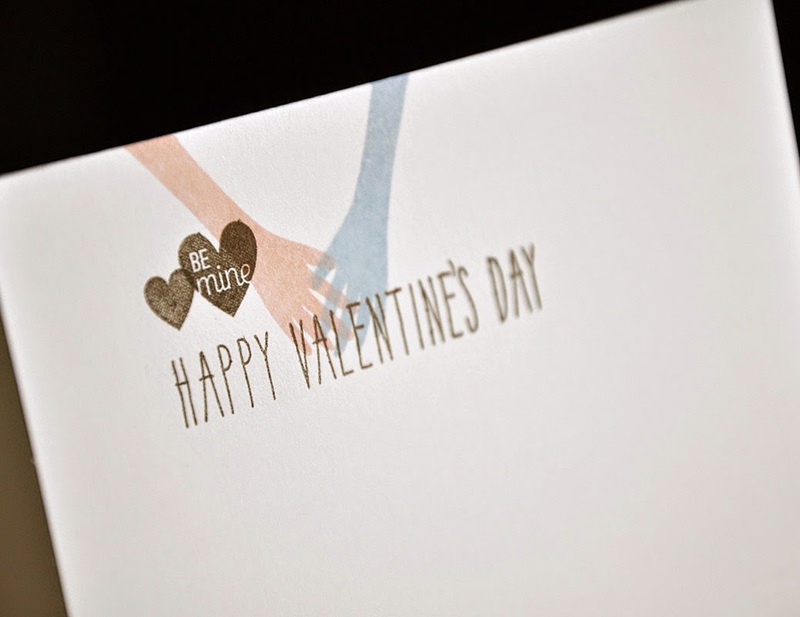 Then stamped the "hugs" over the seam and over the bottom edge of the card. I then finished the card off with a sentiment strip (placed over the seam) and a rhinestone star. Up next, the die cut version. After drawing color inspiration from the pattern paper used above I chose to work with a color combo of plum pudding, blueberry sky and kraft. 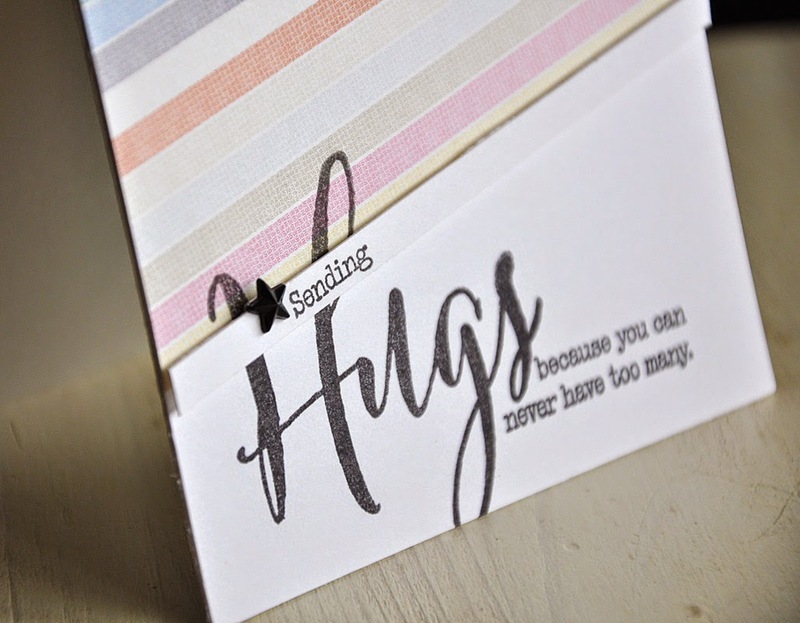 I die cut "hugs" from a rustic white cardstock panel and attached it to the card base at an angle. 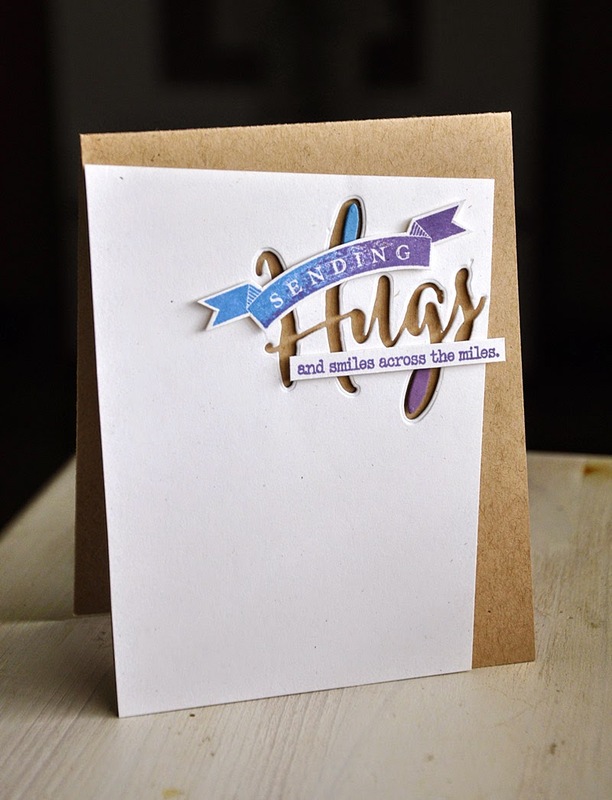 For an added pop of color I completed "hugs" with a couple colorful insert pieces. Well, that concludes my look at Big Hugs. Just remember... these products will be available for purchase through Papertrey Ink, beginning December 15th. Hi there! Welcome to day three of the December Papertrey Ink countdown. I'm joining the design team today in sharing sneak peeks of the new Monthly Moments: December. Feels good to squeeze in one more Christmas project! 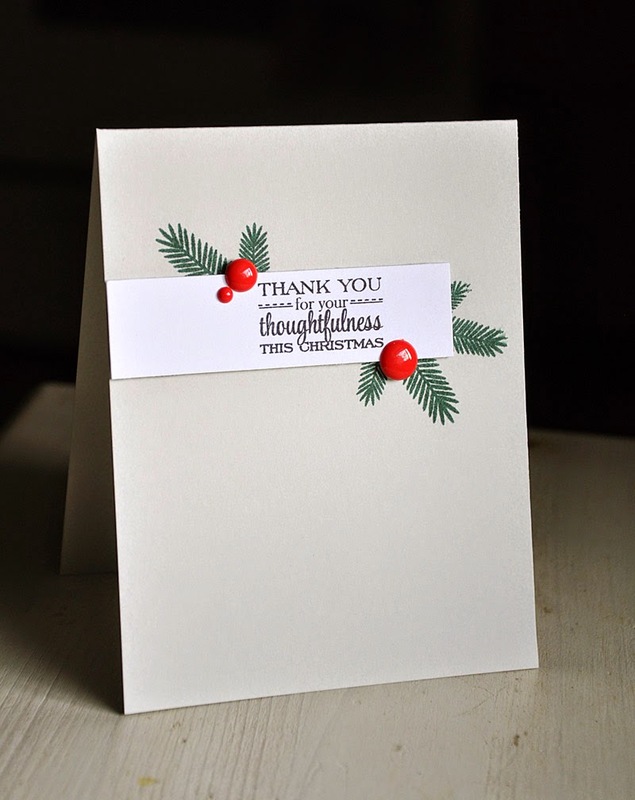 I've got a Christmas "thank you" greeting perfect for after the big holiday. I just love the little bits and pieces included in this set! I had fun exploring the possibilities of each of them and I think I've come to some pretty fun results. This simple little number began with a soft stone card base, adding a touch of color. 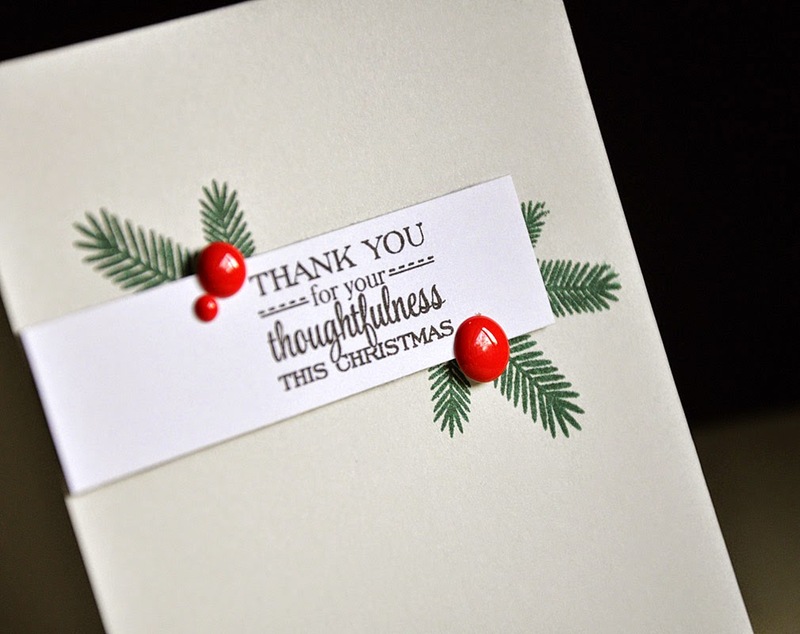 A sentiment from the Holiday Thanks stamp set was stamp onto a white cardstock strip. Before attaching the sentiment strip I took the small and large bough images and stamped them onto the card base allowing them to peek out from the edges. 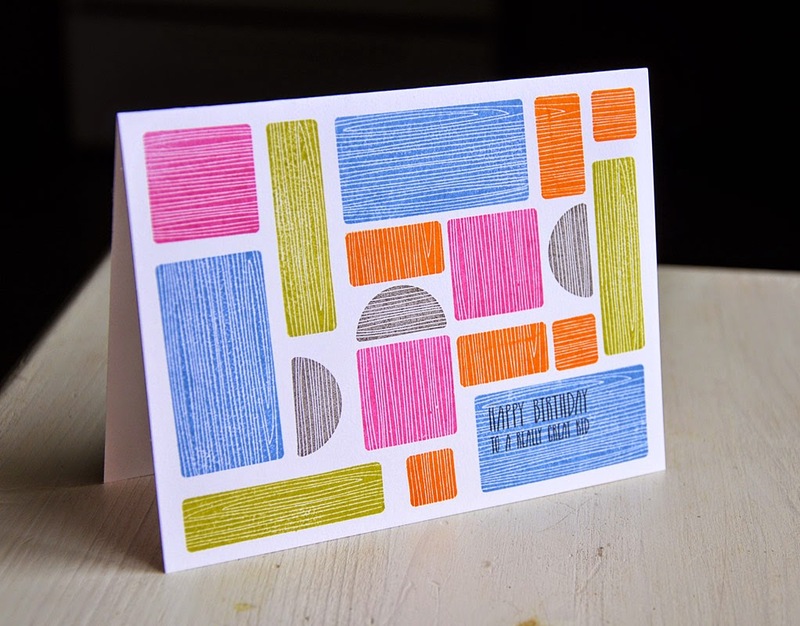 Then finished the card off with a few enamel dots. Well, that concludes today's look at Monthly Moments: December. Just remember... this set will be available for purchase through Papertrey Ink, beginning December 15th. Hi there! Welcome to day one of the December Papertrey Ink countdown. 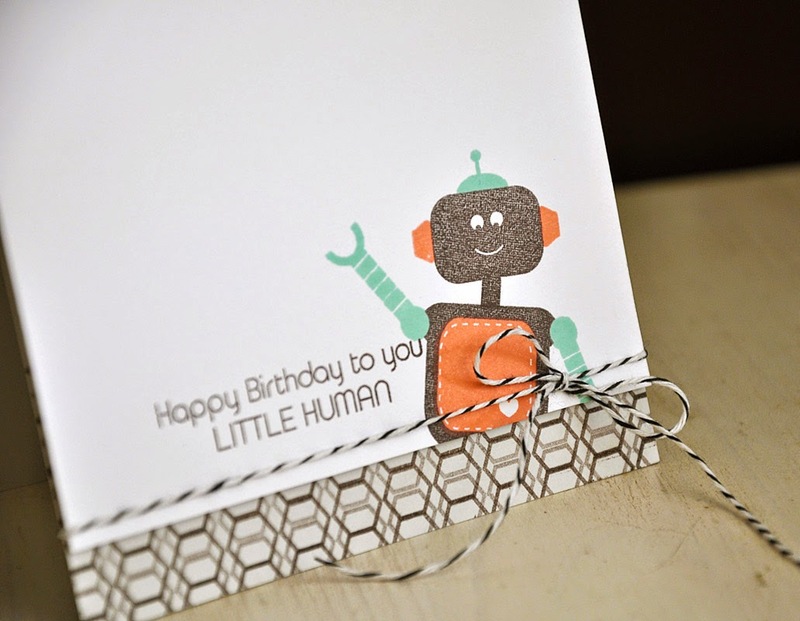 First up, this adorable little guy wants to wish someone a Happy Birthday. He is stamped in smokey shadow, melon berry and aqua mist inks. Thanks to the separate body parts, I was able make this little guy wave. The bottom edge of the card shows a little peek at a hand stamped pattern paper, stamped using the border image included in this stamp set. 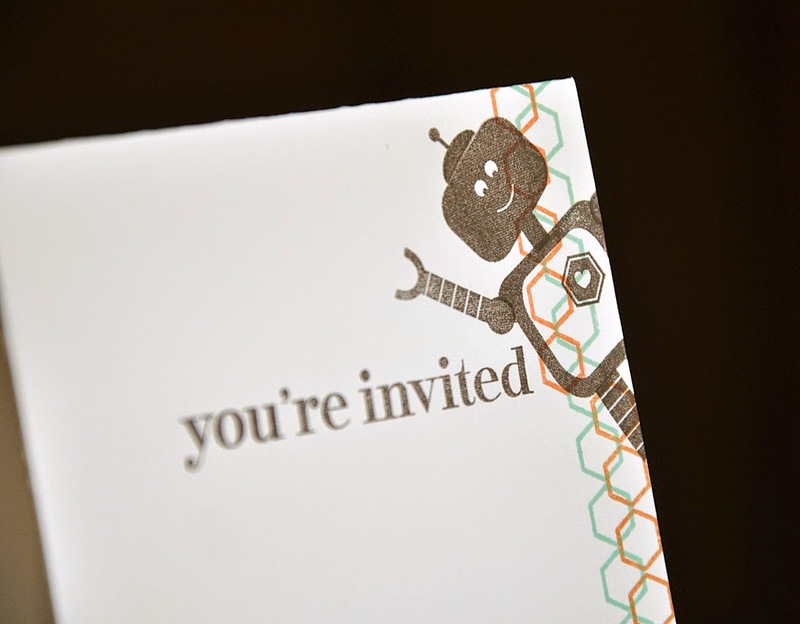 The cutest party invites are a cinch to make using this Little Human stamp set. 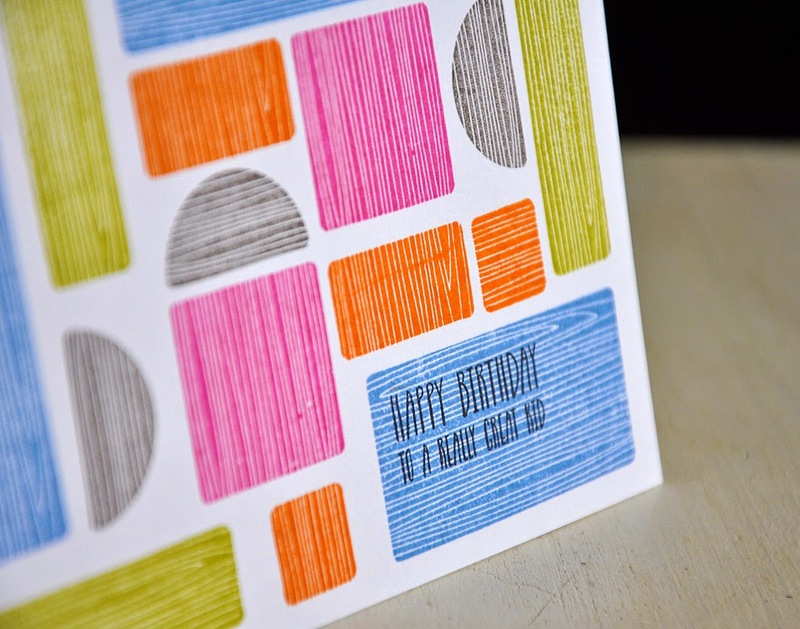 I pulled out the border image once more to add interest along the right edge, stamped it in melon berry and aqua mist. 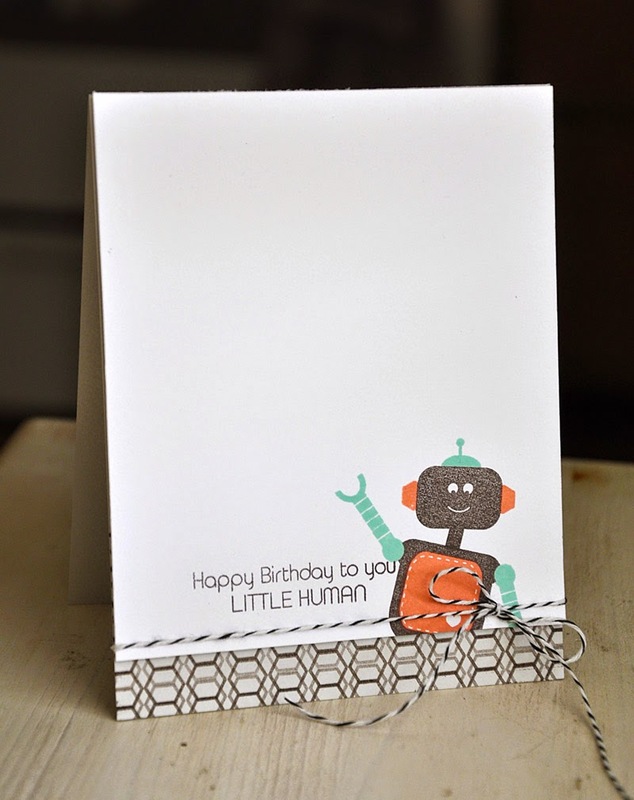 My little robot dude was stamped over the edge in smoky shadow, enticing the recipient in with a wave. 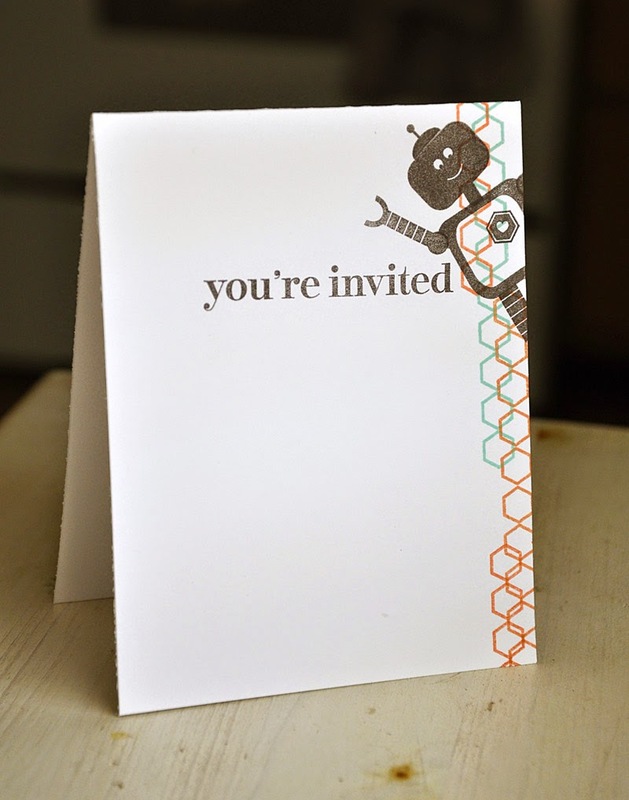 The sentiment is from the soon to be released Keep It Simple: You're Invited. 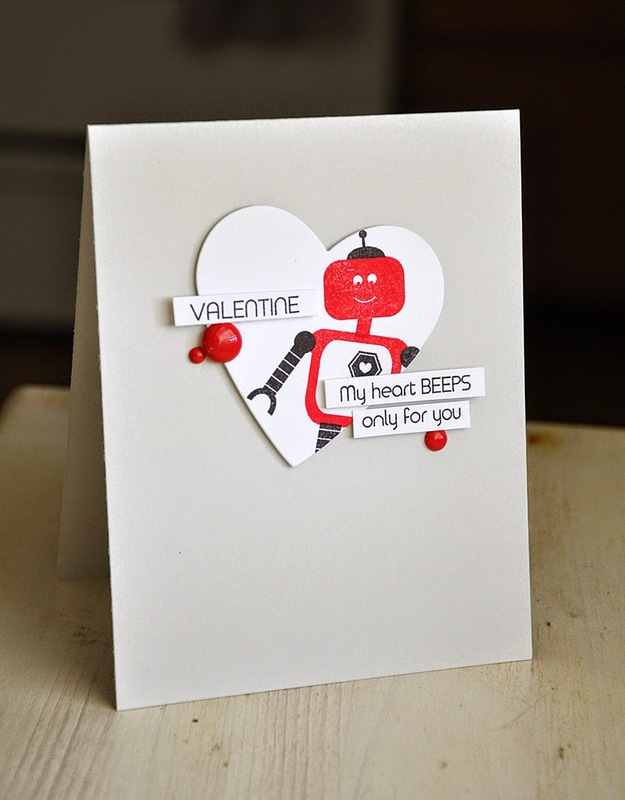 I'll finish things off today with a simply sweet valentine card. Created from a soft stone card base. The die cut heart (cut using the Limitless Layers: 2 1/4" Heart Die Collection) was stamped with pure poppy and true black inks. 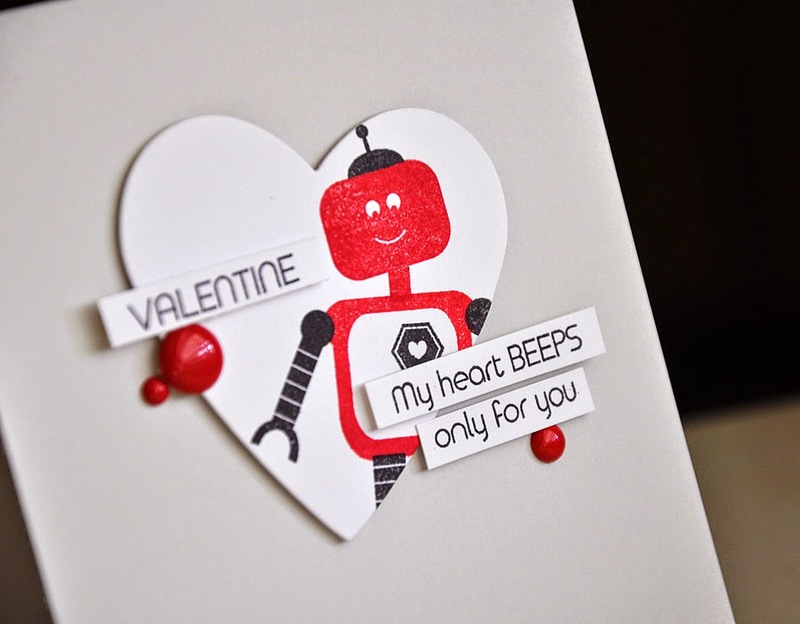 Note the little heart bolt in the robots body, very fitting for the sentiment I chose to use. I trimmed the sentiment into strips and attached the pieces with dimensional adhesive. 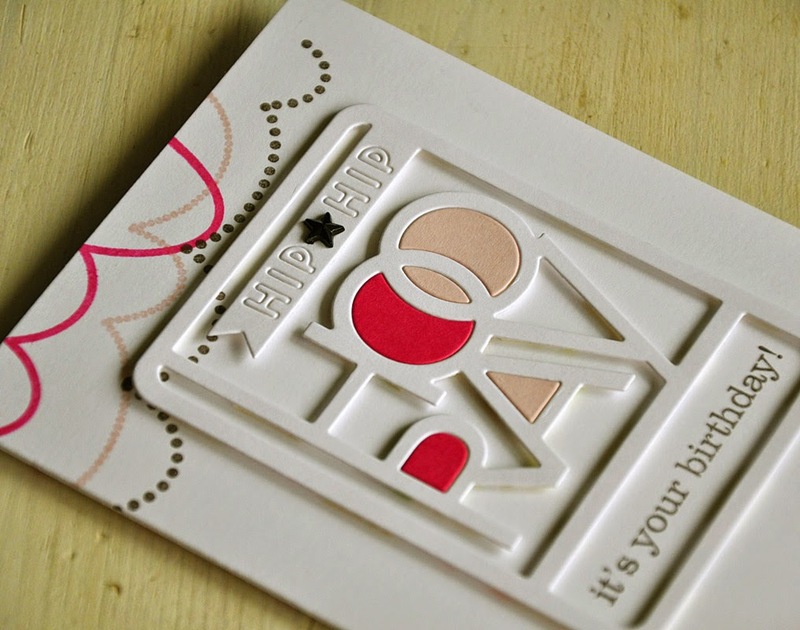 Finished the card off with red enamel dots. Well, that concludes today's look at Little Human. Just remember... all that you have seen today will be available for purchase through Papertrey Ink, beginning December 15th. Thanks for joining me today for the December Papertrey Ink Senior DT Challenge. 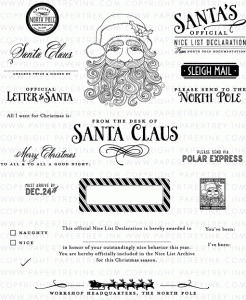 This time around we are bringing back Santa Stationery! Quick and easy is the theme for my projects today. Since Christmas will be here before we know it, we all can use some ideas for the kids that can be executed in not time flat. 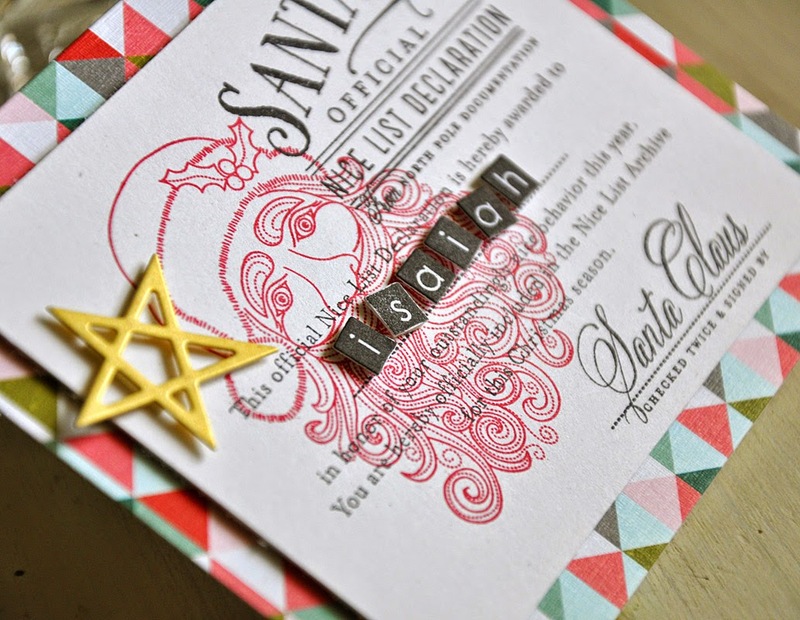 Here's a fun little Santa ensemble using today's featured stamp set. First up, the official nice list declaration. 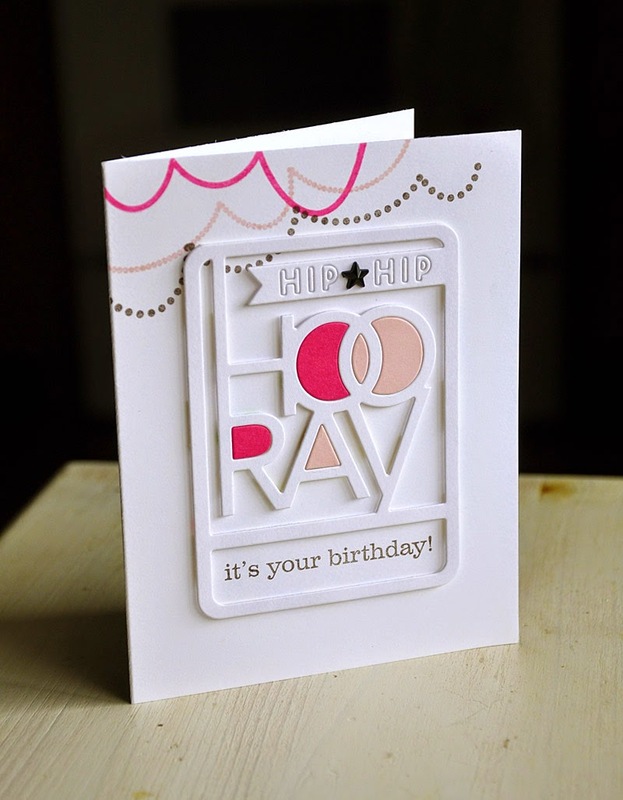 The base of this declaration was die cut from pattern paper using the Card Base-ics #2 die. I trimmed a cardstock panel to fit on top measuring 4 3/4" by 3 1/2" allowing a bit of the pattern paper to show as a border. This is sized perfectly to fit into a basic A2 (typical card sized) envelope. 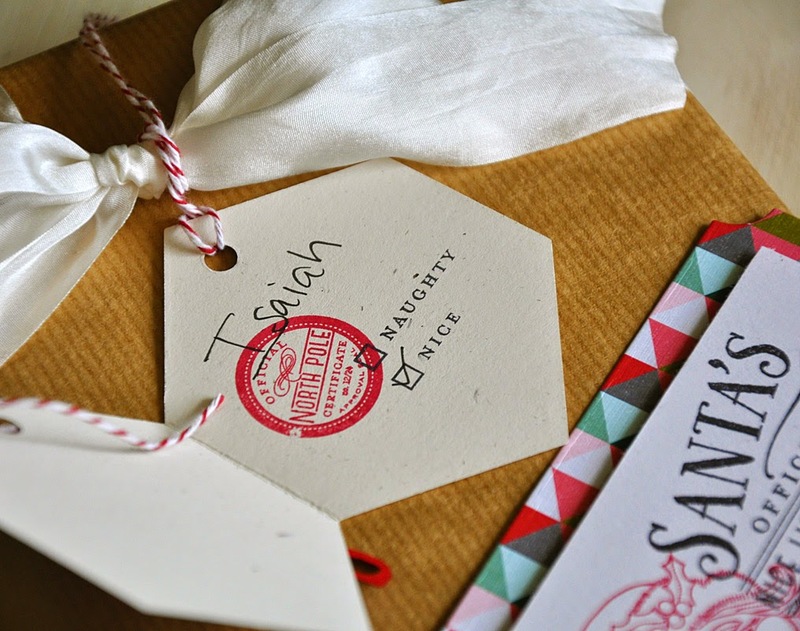 Santa was stamped first in pure poppy and then the wording in true black over him. The Type Strips are a fun way to include the child's name and a golden Sketched Star makes for a sweet shimmering touch. These embellishments aren't necessary but they add a fun touch. 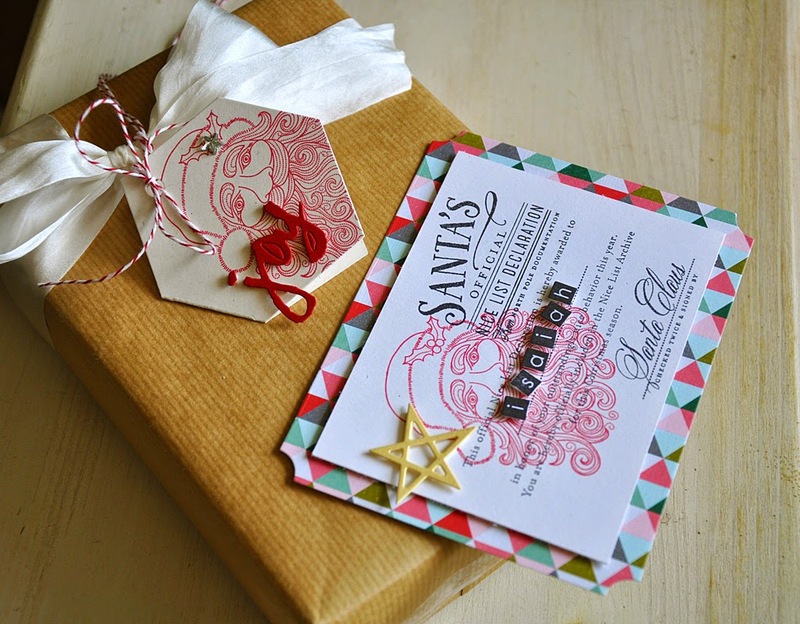 Can't forget about the coordinating gift tag! This one was created using the Folded Foodie Tag die. 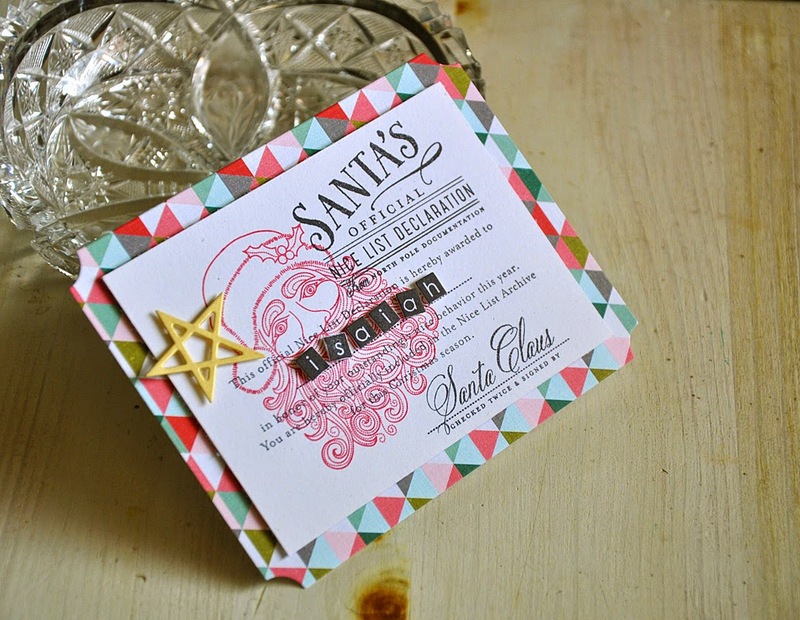 Santa's cheerful face was stamped over the edge and topped with a die cut "joy". Then tied with bakers twine and embellished with a star rhinestone. Easy peasy! For an added special touch... the inside was personalized.